Zoomed into snow of Svinafellsjökull Glacier Icleand. 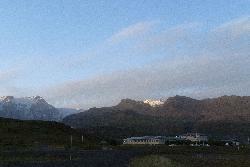 Photo of Fosshotel Skaftafell in Iceland with mountain and glacial backdrop. Pond in front of Svinafellsjökull Glacier Icleand. 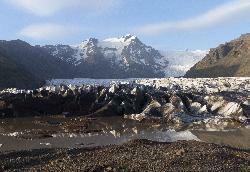 Photo of water in front of melting Svinafellsjökull Glacier tongue in Icleand. 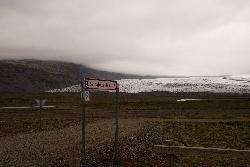 Photo of Svinafellsjökull Glacier tongue in Icleand. from site: All About Glaciers is a glacier site with something for everyone from glaciologists to grade school students, exploring nearly all aspects of glaciers including data and science, facts, a gallery, a glossary and much more. from site: A glacier is a large persistent body of ice. Originating on land, a glacier flows slowly due to stresses induced by its weight. 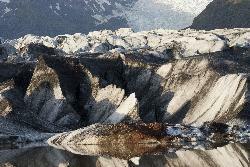 The crevasses and other distinguishing features of a glacier are due to its flow. Another consequence of glacier flow is the transport of rock and debris abraded from its substrate and resultant landforms like cirques and moraines. from site: At present there are no reliable figures on the total number or area of glaciers in Canada. The National Hydrology Research Institute, Environment Canada, is in the process of identifying and measuring all glaciers. The table shows the best available estimates for areas by region, and the number of glaciers for those areas surveyed to date. Vatnajökull National Park Links: Vatnajokull National Park site.